Yes, thanks… it worked, but why now i get this horrible color in place of the previous? How to get the names of the stations like before? Thank you. Worked fine for me after flushing the browser cache. Not sure. I use two themes that both look as I expect. The default theme looks the same as your image. I am a mwc-button ignoramus, so you’ll need to find help elsewhere. Sorry. Will you share the two themes so i can try them? Just wondering if there is a way to divide or split the stations up. OK, I opened a PR. 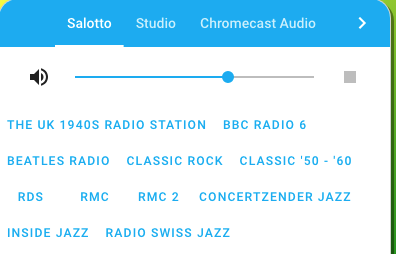 This is awesome… my radio package failed with the new update (in the script call method) so I found this and put it in my system… i absolutely love this. Its fast and syncs perfectly through grouped speakers. Thank you so much for contributing this! About grouping stations… I had originally thought about that as well but couldn’t come up with a nice way to display them, while still keeping the “80s radio pushbutton” simplicity I aimed for with the buttons. Does anyone have an idea of how grouping stations could look like? maybe a hand-draft sketch? How did you divide Local Radio from Tune In? Will you share the code? EDIT: @rotcop4u2 How did you get the TuneIn URL’s ? They re very different from what i get… which is your method? @lukx I love the push button style and don’t want that changed.